In case you missed it, I’m doing “Famous Musician Week”, where I’m sharing my little stories of when I have met some pretty talented (famous) musicians. So far, I’ve told you about my run-ins with singer Josh Groban, and violinist Joshua Bell. Today I have another violinist for you. Itzhak Perlman. Some of you youngins might not know who he is. He is possibly one of the biggest Classical music world superstars that has ever lived. He performed for Pres. Obama’s inauguration, Pres. Clinton awarded him “National Medal of the Arts”, and he’s performed for kings and queens. He possesses 4 Emmy Awards and 15 Grammies. Yes, 15! He runs the Perlman School each summer and also holds a founding chair at Julliard. Aside from this, he tours the world throughout the year performing beautiful music with various symphony orchestras. 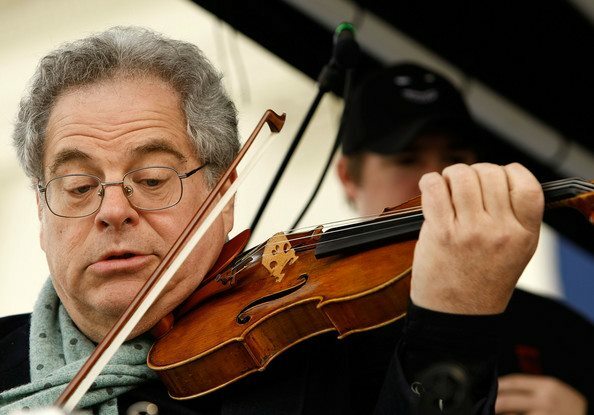 Personally, I grew up knowing his music not only on the various CD’s that my mother owned, but also because when I was learning the play the violin as a child, my mom (who was my teacher) would always tell me these wonderful things about Itzhak Perlman. She deemed him the “greatest violinist that ever lived”. And so of course that is what I grew up thinking as well. Just a few years ago, while I was working for the Seattle Symphony in the Education Department at Benaroya Hall, I was at work one day browsing through the upcoming symphony concert calendar to see who was coming this season. As I had mentioned before, even though this was just an underpaid office-rat sort of job, the biggest reason why I took the job was for it’s incomparable perks – such as getting to play piano and violin all day long, teach people about my instruments, go to unlimited symphony concerts for free, and meet famous musicians. As I was looking at the concert calendar, I saw that Itzhak Perlman was coming that week to perform with the Seattle Symphony. My eyes got huge and I knew I had to go to that concert. I went down to the ticket office and put in a ticket request for the concert, and was told that the concert was completely sold out. Of course it was. It’s Itzhak Perlman. Well, if I wasn’t going to get to go to the concert, then I wanted to at least meet him when he comes to rehearse. I had to jump through a LOT of hoops to make this happen, let me tell you. After multiple emails back and forth between the conductor’s assistant, myself, and artist relations person, I finally got the green light. And Mr. Perlman was on such a tight schedule, it was going to be quick and efficient. I was told to be backstage after that morning’s rehearsal at 10am. I was there with bells on. Backstage had completely cleared out and nobody was there. The AR person found me and said that Itzhak was in his dressing room but would be out in about 10 minutes, and she would bring him over to me. I stood there and waited…and waited…and waited. It was almost 10:30, and I was starting to think that he got busy doing something else. Just as I was about to give up, he came wheeling out of his dressing room, alone, and down the corridors of back stage. He zoomed right past me (in case you didn’t know, he is in a wheelchair). I thought, uh, wait a minute! And I followed him. I just assumed that the AR person completely forgot about me and this was going to have to be up to me and nobody else. He stopped, turned and looked at me like I was completely out of line. I gulped, and went forward with my plan though. He just looked at me like he had no clue what I was talking about. 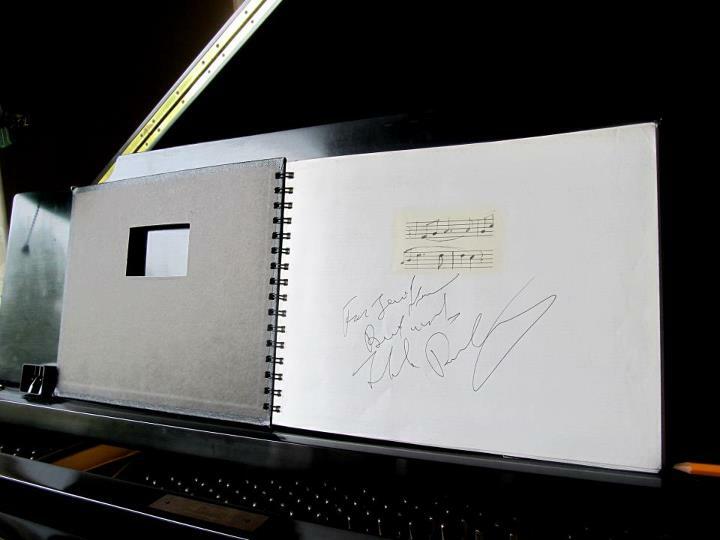 He opened up to the front cover of my composition book (which is the book I wrote all of the songs for Key of Sea in), and signed it “For Jennifer, Best Wishes, Itzhak Perlman”. He gave me a half-smile, and then he was off like a madman in a wheelchair. That thing had some speed! My heart was pounding and I was completely excited to have his signature on my book. Forever. He wasn’t as nice and cordial as I had imagined him to be, but I’m sure me jumping up on him backstage wasn’t exactly what he may have been expecting either. To read more from Famous Musician Week, go here. This entry was posted in Famous Musicians Week, Funny Stories and tagged Itzhak Perlman. Bookmark the permalink. Famous Musician Week – The Time That I Met Josh Groban.